Jay Z and his pals in the pop world relaunched the music streaming service Tidal this week. Z bought the service for $56 million at the end of last year, and has now added a £9.99 a month Spotify-rivalling premium tier. Which, confusingly, is actually cheaper than its previous tier. But the event was about much more than just launching a service. It was about the future of music. And while the pop illuminati might herald it as a new front in the digital age, most onlookers were sceptical, to put it politely. In an article headlined: "Tidal: An overpriced music streaming service that only benefits the super-rich members of a messianic-like cult? Where do I sign up?" Michael Segalov made the point that the service won't benefit up and coming musicians, only those already established and rolling in cash. "A group of people with a combined wealth of $2.7bn want to make themselves even richer, with no mention of the artists who struggle to make ends meet – that sounds more like it... 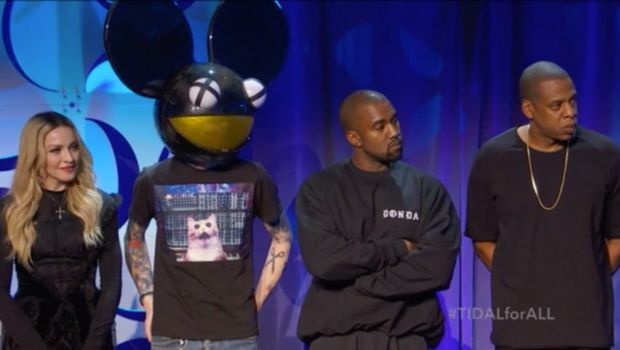 So you can imagine where the focus of Tidal is going to be, and where its allegiances will lie." PC Pro lists five reasons why the service won't succeed (and it has an awesome gif of Madonna and Deadmau5 failing to shake hands). Among them are the all style, no substance press conference, the niche appeal of lossless audio, and the fact that almost all the music on Tidal is already on Spotify. The press conference was something to behold. Alicia Keys spoke for four minutes about... well, who knew what it was about. As any journalist knows, people talk flimflam when they have something to hide. In this case, we fear, it was what all the artists knew but couldn't admit: this is a way for them to earn more money. Which seems a bit rich – no pun intended – considering all some of them ever sing about is how minted they are. They also signed a declaration – here it is in all its glory. If that's not flimflam, we don't know what is. Tidal hit back at the criticism. Vania Schlogel, Tidal's chief investment officer, told Billboard: "If an established artist goes out and steps out of the box and says, 'I'm trying something different', that invites criticism. There is some bravery for what these artists are trying to do. It's not to fill their own pockets, it's to create a sustainable industry." The criticism didn't do the service any harm. Its shares were up 938 per cent following the announcement.